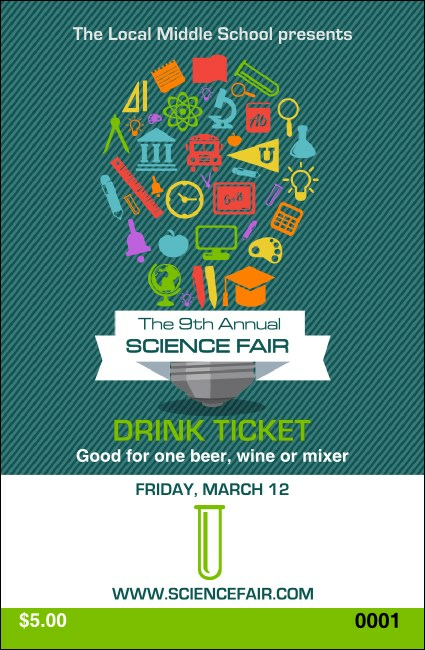 Let inspiration guide you to use the Science Fair Drink Ticket! A boldly pin-striped background in playful shades of blue highlights a giant central light bulb made of the brightly colored common tools of students everywhere. This scholarly template allows for up to nine lines of your event data. Approximate size 2.71" by 4.14"
The right drink ticket for every event is waiting at TicketPrinting.com!